Originally built in 1850, this suspension bridge crossed the Cumberland River and connected the city of Edgefield directly to downtown Nashville. 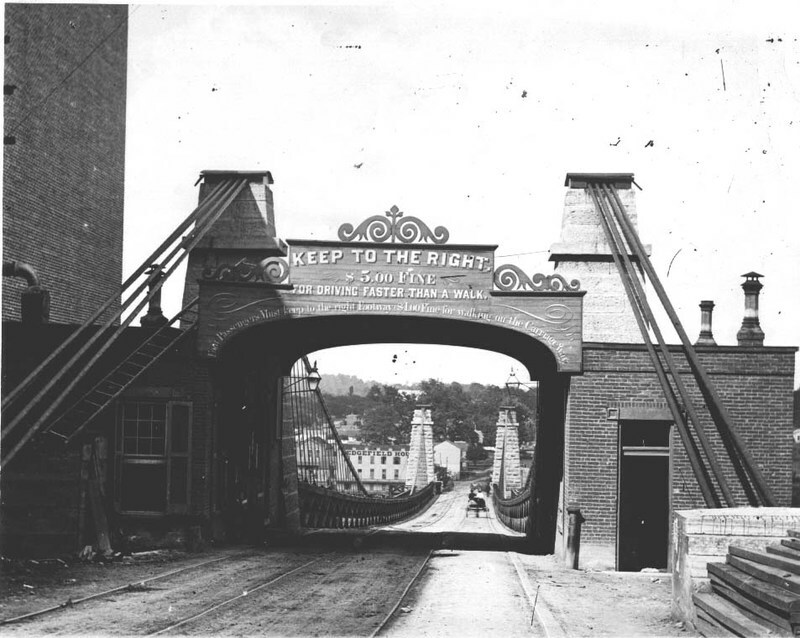 In 1874, The <em>Republican Banner</em> printed an article about the bridge highlighting its importance to the town. “The building of this bridge gave an impetus to the growth of Edgefield, making desirable a large body of land which was not so well reached by the old bridge.” This suspension bridge allowed the affluent of Nashville to more easily escape the crowded city and live in a quiet suburb. Prior to the construction of the bridge, those who wanted to go from Nashville to Edgefield would either have to take a ferry across the Cumberland River, or travel north to the bridge connected to Gallatin Pike. The 1850 bridge was designed by a Nashville architect, Colonel A. Heiman and built by a contractor named Captain M.D. Field, whose brother supervised the laying of the first Atlantic Cable. Confederate troops destroyed the suspension bridge during the Civil War, but it was rebuilt in 1866 and owned by the Nashville and Edgefield Suspension Bridge Company. A family with one horse and buggy would have to pay around $50 a year in order to use the bridge. Many residents of Nashville and Edgefield thought that the price was too high; newspapers even called the prices “a little oppressive.” A new, free bridge was not built until 1882 by the Broad Street Bridge Company and was purchased by the city for $75,000 in 1883. It was located where the Woodland Street Bridge stands today. The construction of the free bridge was so applauded by the people of Edgefield that there was a ‘jollification meeting” held in the public square in celebration. Austin Hall, “Edgefield Suspension Bridge,” Bygone Nashville, accessed April 25, 2019, https://bygone-nashville.mtsu.edu/items/show/39. “The Suspension Bridge” The Daily American[Nashville] 28 March 1882: 4. Print. “Growth of Population on Across River Showed Need for Bridge in 1819” The Nashville Tennessean 15 June 1930: 75. Print. “Edgefield.” Republican Banner[Nashville] 22 March 1874: 4. Print. “Monopoly-The Nashville and Edgefield Suspension Bridge Tolls” Republican Banner[Nashville] 15 September 1869: 4. Print. “The Free Bridge” The Daily American[Nashville] 02 April 1882: 1. Print.